To channelize the college efforts systematically to achieve academic excellence. To usher quality through Identification and removal of deficiencies in conduct of academic and administrative activities in the college. Facilitating learner-centric teaching methods using appropriate pedagogical strategies and ICT. To arrange for feedback from stakeholders to enhance quality in education at KRK Government College. Dissemination of information from various departments of the college. Support the adoption and implementation of best practices. Organise workshops, seminars, Quizes on subject-related processes. Preparation of Annual Quality Assurance Reports (AQAR) for submission to NAAC. Prepare institutional strategic plan in the beginning of the academic year. All the constituent units of stakeholders are actively involved in the holistic approach of quality education in the college. Periodic meetings with stakeholders are organized to facilitate transparency of goings-on in the college, exchange communication for furtherance of quality based on the emerging academic needs. Feedbacks from the stakeholders are collected periodically through structured forms and offline/online, analysed and necessary action initiated through Principal. The Coordinators of IQAC, Academic cell along with members under the chairmanship of the Principal conduct annual internal audit and also play a pivotal role in the audit organised by nominated peer representatives from A.P. Commissionerate of Collegiate Education. The cell disseminates college information for submission to external agencies like NAAC, NIRF, AISHE, other offices when required. 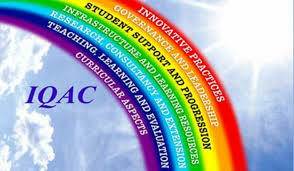 IQAC initiates, facilitates and supports the organisation of workshops/seminars for quality enhancement and encourage academic aptitude in young minds. Workshops/seminars include administrative programmes to staff and certificate/interdisciplinary courses to students.